‘My passion for writing led me to the idea of a memoir about my dog, Max, and my experience with him at a time when he was ageing quickly. Time was ticking over and I knew my writing would entail hard work. English is my second language and I am never fully confident with what I write. So how did I start? I started by joining the NSW Writers’ Centre to get to know the writing scene. The Mentorship Program sounded promising and I decided to find a mentor. The professional experience of Diana Giese impressed me and her profile indicated that she’s someone I could work with. We started working together in late 2011, when I was about to complete my first draft. As it has turned out, Diana was exactly the right mentor that I needed at a time of confusion and frustration in my writing journey. At our first meeting, she switched on a bright light to let me see clearly the strengths as well as the many drawbacks of my manuscript. Diana was quick to point out what would not work, but also sensitive enough not to make me feel bad about my writing. Her interest in my story was encouraging and right at the beginning she was positive about the prospect of publication. But she also alerted me to the obstacles. Her strengths in writing and editing were clear right at the beginning, and so was her gift for mentoring. We talked through emails and over the phone, I sent over my amendments, and she instructed me how to refine the language and the story. It was not a straightforward process, but I went through it with much satisfaction, feeling that I could trust Diana. Her gentle and opened-minded approach made the consultation easy and rewarding. Over time, I have learnt a lot about how to write well. Looking back, I now understand how valuable her suggestions were, like deleting the prologue and putting in more details of my family’s life with the dog. Under her guidance, I completed many drafts of the manuscript and became more confident in my writing, even daring to imagine publication for my book. With her knowledge and experience of the publishing industry, Diana was able to send my manuscript to a dog-loving agent, Selwa Anthony, who instantly loved my story and passed it on to a publisher. The path to publication was both efficient and pleasant. 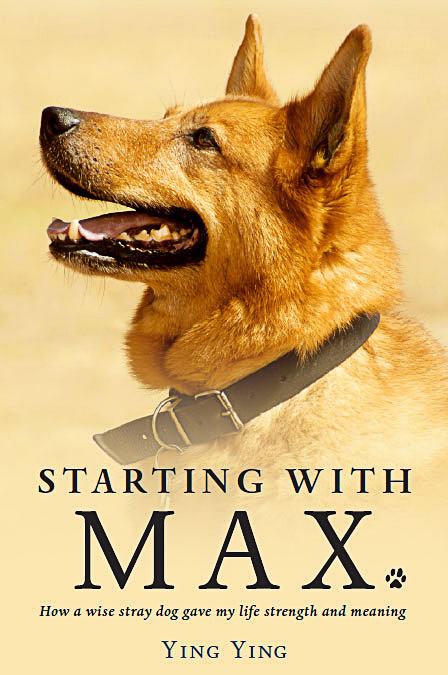 My first book in English is Starting with Max. ‘We live by time, with time and for time. We are a product of our past and we are unceasingly creating our future. We act and react in a process involving people, animals, things and events, with a purpose, a task and a goal. To live a human life is to embark on a mission with endless duties, worries, troubles and burdens, and sometimes miseries. Of course, we also experience excitement, satisfaction, happiness and joy, but it doesn’t make sense to say we live a carefree life. Because of its very nature, our human life can never be free from care, for we are constrained by time and our awareness of it. No matter what we do, time runs away. To be human is to be in a timeline, with our consciousness repeatedly being shifted back and forth. We remember and are shaped by our experiences of the past, even as we visualise and make plans for the future. That’s why we can never truly relax and enjoy the present, and why some people try to forget time for a while by indulging in drinking and drugs. Despite what the positive-thinking gurus may advise, we can never live only for the present.